Left: Execution chamber in Sing Sing's original Death House circa 1890s. 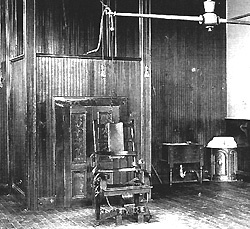 Right: Execution chamber in the "new" Death House" circa 1923.
. . . . New York State was in search of a humane method of execution. On June 4, 1888, Gov. Daniel B. Hill signed a bill authorizing the use of the electric chair. The jolt of electricity from the electric chair rendered the victim unconscious in less than a second, before any pain could be felt. The first execution [at Sing Sing] took place on July 17, 1891 . . . Harris A. Smiler being the first person executed at Sing Sing. Four other prisoners were executed by similar means on the same day at Sing Sing. Executions usually took place at 11 on Thursday nights. Twelve witnesses, along with two doctors, the prison chaplain, the executioner, seven guards, and the warden, were required to be present. 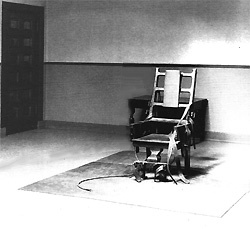 The building that housed the electric chair was referred to as the Death House. It was a prison within a prison. There were 24 cells, plus an additional three cells for women. It had its own hospital, kitchen, visiting room, and exercise yard. The section where the prisoners spent their last day was called the Dance Hall. This pre-execution chamber was connected by a corridor, which was called the Last Mile, to a room where the chair was located. ln 1928, the execution of Ruth Snyder caused a state of commotion and uproar. Snyder and her boyfriend, Judd Gray, were convicted in a triangle murder. . . .
Francis "Two Gun" Crowley was 19 when he was executed in the electric chair in 1932. . . . Crowley became the notorious two-gun bandit when he murdered a police officer. While in the death house, he set his mattress on fire, fought with the guards, and destroyed his cell. Crowley was moved to a special cell that was isolated from all other prisoners on death row. About three days after his isolation, a starling flew into Crowley's cell. He fed the bird, and it kept coming back. The next day, Crowley agreed to behave if he could keep the bird. Crowley tamed the bird, and the bird apparently tamed Crowley. Crowley spent the remainder of his time in the death house drawing and sketching. . . .
Julius and Ethel Rosenberg were the first civilians to be found guilty of espionage in the United States. In 1953, the Rosenbergs were convicted of conspiring to transmit atomic secrets to the Soviet Union. . . . As the hour of retribution approached, crowds gathered and demonstrated at the gates of Sing Sing and in New York City, London, and Paris. A total of 614 men and women died in the electric chair in Sing Sing, and since 1914,all executions in New York State were done there. The last execution at Sing Sing Prison occurred on August 15, 1963. "Death row . . . in 1929 photo. Prisoners . . . were kept isolated from general prison population and under 24-hour surveillance to prevent suicide. "Meals were passed through an opening in the steel doors, and smoking was permitted as long as the keeper lit the cigarette or cigar. "For relaxation, inmates were allowed access to [materrials] from the prison library." "Witnesses, warden, clergy- man, and doctors were seated in [the witness] area of the new death house c. 1923 . . . . witnesses are chosen from those who do so as a matter of civic duty . . . ."
Click here to bring up 1929 death row image and circa 1923 image of execution witness seating section. After viewing image, close its window. Left: "Used unitl 1922, the old Death House was a small building made of stone." Right: "The nearly complete ["new"] Death House . . . 2 wings with 12 cells each and two exercise yards . . . In 1971, when the electric chair was removed, the Death House was converted to a vocational shop,"